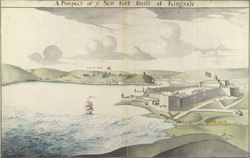 View of Fort Charles, located in Kinsale Harbour in County Cork, Ireland. The fort was built in 1677 on the site of an earlier Norman fortification and is the most impressive military fort ever built in Ireland. It was named Charles Fort by the Earl of Ormond, in honour of King Charles II. Architect William Robinson has been credited with designing the star shaped fort with 5 bastions- Devil’s and Charles’ face the sea whilst The North, Flagstaff and Cockpit face the land.